What Are the Stars in Orion’s Belt? Orion dominates the winter sky in the northern hemisphere. Its large size and collection of bright stars — such as Betelgeuse at the shoulder, Rigel below the belt, and the three stars in the belt — make it easy to spot, even for beginning stargazers. So how about those stars in the belt? They’re one of the most famous asterisms in Western culture, but beyond what we see with our eyes, what are their astronomical properties? First, a brief word about the constellation itself. In many mythologies, the shape is seen as a human figure — and in Greek mythology, it was named after a hunter, according to a web page from the Chandra X-Ray Observatory. There are several “reasons” in mythology for why Orion ended up in the sky. One was because he was too boastful about how many animals he could kill — so he was put there to teach humility, since he and his dogs (Canis Major and Canis Minor) chase after animals in the sky but can’t catch them. Some say he died from a scorpion bite, and other legends say he was killed by his lover Artemis accidentally, when her brother Apollo tricked her to shooting an arrow at him. The three stars in the belt are Mintaka, Alnilam and Alnitak. According to an astronomer with the National Radio Astronomy Observatory, Ronald Maddlaena, these are the meanings of the three stars: Mintaka (on the west) means “belt”, Alnilam (in center) means “belt of pearls” and Altnitak (right) means “girdle.” The three range between 800 and 1,000 light-years from Earth. The stars “probably formed at about the same time some ten million years ago from the molecular clouds astronomers have found in Orion,” wrote Maddalena. Alnitak: 20 times more massive and 10,000 times brighter. (Surface temperature 60,000 Fahrenheit). To further blow your mind — these stars also have companion stars orbiting with them, so what you see from Earth with the naked eye isn’t necessarily what you always get. 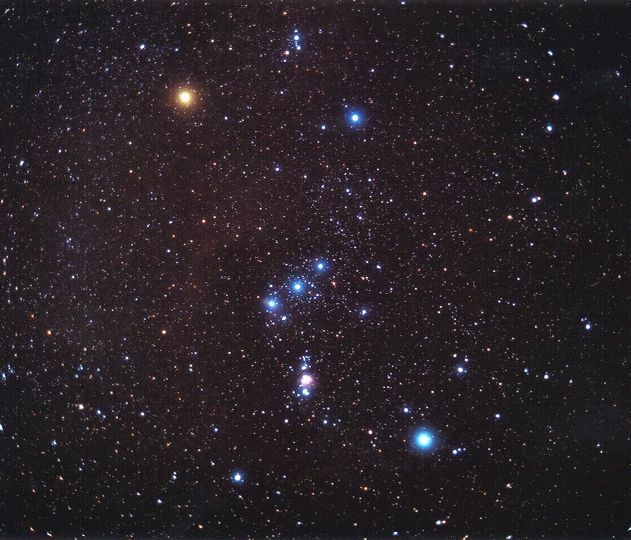 We have written many articles about Orion for Universe Today. Here’s an article about the Orion Nebula, and another about the dust grains in the Orion Nebula. We’ve also done many episodes of Astronomy Cast about stars, such as this: Episode 12: Where Do Baby Stars Come From? Thanks rc, very nice work! I haven’t seen this 3D model before.